When his grandfather dies unexpectedly, Ari and his remaining family gather at the cabin deep in the woods. At the reading of the will, another surprise greets Ari, his dad and his aunt: Grandpa left the cabin and all his land to Ari. Uninterested in the remote property that conjures painful memories, Ari’s dad and aunt make plans to sell everything. Ari is determined to change their minds. Author Kathleen Cook Waldron brings to the story her own experience living in the bush. The details of the cabin and surrounding land and community are told in vivid detail so that even the most urban readers can perfectly picture the serene woods, playful stream and peaceful lake. Through Waldron’s clean storytelling, we follow a grieving family as they wrestle with loss. I loved how each member of Ari’s family reconnected with his grandfather through the experience of staying at the cabin. Though he’s no longer present, his love for his family is so clear in the things he left behind. Each character discovers and responds to these unwritten love letters from their father or grandfather. In these moments, Waldron’s writing is moving, subtle and clever. This is a great story about the opportunity grieving families have to rediscover their lost loved one and renew relationships with one another. The rustic setting gently reminds us to consider what’s really important. 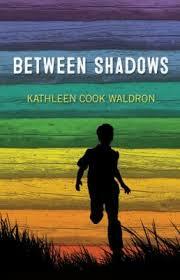 Tagged Between Shadows, Canada, Coteau Books, grief, Kathleen Cook Waldron. Bookmark the permalink.